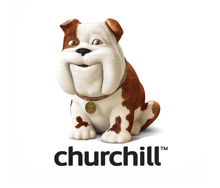 Churchill Insurance is a well-known British Insurance company (we’ve all seen the ads featuring the nodding Bulldog). While it is mostly known for providing car insurance, Churchill also offers travel, home and pet insurance. Check our article on the best insurance for dogs, to see if Churchill feature. Churchill’s pet insurance policy is underwritten by U K Insurance Limited, who also underwrite for Direct Line. Pet Emergency Cover – includes up to £1,500 in vet fees for accidental injury (illness not covered), up to £500 for emergency treatment for a sudden or unexpected illness, up to £1,000 for advertising or reward in case your pet is lost or stolen, up to £500 if your pet dies from an accident, up to £750 for emergency boarding fees and up to £3,000 holiday cancellation. Pet Insurance Cover – includes up to £3,000 in vet fees for each illness or injury (for 12 months from the first date of treatment for each new condition), up to £1,000 for advertising or reward in case your pet is lost or stolen and up to £500 if your pet dies from either an illness or an accident. Both policies include bereavement counselling and access to a legal advice line as standard. Third party liability up to £1,000,000 can be added to either policy for dogs only. Overseas travel cover is also available, for both dogs and cats. Do Churchill offer Rabbit Insurance? Churchill do not offer insurance for pet rabbits – if you would like more information on the companies who do offer this cover, have a look at our guide to Rabbit insurance. How much does pet insurance from Churchill cost? The cost of pet insurance is affected by many different factors, such as the type and breed of pet, the pet’s age and medical conditions and the owner’s postcode. Churchill offers a multi-pet discount. What do Churchill Pet Insurance customer reviews say? Because Churchill is mainly known for car insurance, there are not many reviews of its pet insurance service online. On Reviewcentre.com Churchill Pet Insurance got 1.9 out of 5 stars and 25% of the 16 people who left reviews said they would recommend the service. On Petinsurancereview.co.uk, things are a bit more positive, with 3.8 out of 5 stars. To give you a better indication of customers’ views of the company, Churchill’s car insurance service got 6% for customer satisfaction on Which?. Churchill Insurance as a whole got 3.89 out of 5 stars on Reviews.co.uk from over 500 reviews, with 74% saying they would recommend them. What do Churchill Pet Insurance reviews from the experts say? Defaqto – the independent financial services reviewing site – gave both Churchill’s Pet Insurance and Emergency Pet Insurance options 3 out of 5 stars in 2018, making them "standard products providing an average level of features and benefits". Then follow this link to get a quote on the Churchill website. Bought By Many has created three unique pet insurance policies by listening to the needs of thousands of customers. Check them out here.